Bill Laughridge is Cylinder & Slide, and he’s been in business for a long time. I first met him at the 1984 Second Chance shoot, where he had his traveling trailer of gunsmithing goodness. Bill was relatively new at the time, having opened C&S in 1978. He has all the tools and parts needed in the trailer to do the hand-work of gunsmithing. No lathe or mill; that’s just too much weight to haul. But he can do all the rest. Imagine my surprise when I was at the 2007 Bianchi Cup, and I turned a corner to see Bill and his trailer. Or at least, the newest iteration of the trailer. Bill does 1911 work, he does Browning Hi-Power work, and he’s one of the few guys left who still does Colt “V” spring revolver work. (That’s the Official Police, Python, Detective Special guns.) 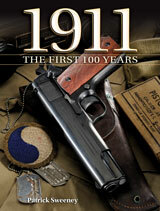 Bill teaches a 1911 armorers course that is to die for. You arrive at his class with a box o’ parts, and you leave the class with a gun you built. Located in Fremont, Nebraska, Bill is convenient to all the delivery services, but not handy to drive to. Unless, of course, you’re driving to someplace across the country. He also offers upgrade parts, hammers and sears, which often find their way into the custom builds of other gunsmiths. After all, if you can get a perfect trigger pull by dropping in a C&S hammer and sear set, why not? Bill does more than just 1911s; he works on a whole raft of guns, but he has made a national name for himself doing 1911 work. At the 2007 SHOT show, Bill stunned us all with his bravura gunsmithing when he took a base gun (Caspian slide and frame) and turned it into a 1908 pocket model in .45 ACP. Not a 1908 interim test gun, but basically a scaled-up 1908 .380 Auto, chambered in .45 ACP. The idea was to make something new and different. In order to make the slide a hammer-enclosing slide, he had to fit and silver-solder a cap on the end of it. Unless Bill told you, you would not see the joint, that’s how precise it was. Well, things got out of hand, and Bill had people actually chasing him, checkbook in hand, to make one for them. Despite quoting a staggering sum, he had buyers for identical guns. So, if a custom 1911 or BHP isn’t enough for you, you can have Bill make a 1908 pocket model in .45. Me, I think I’d hold out for a 1905 Government-sized model. And, if a “pocket” .45 ACP is a bit much for you, find a clean M1903 in .32 or 1908 in .380, and Bill can make it into a pocket 1911 clone, with magazine release in the right spot, low-profile sights, and a thumb safety you can actually work. A clever fellow, and yes, he’s had the handlebar moustache for as long as anyone remembers. This article is an excerpt from the new Patrick Sweeney book, 1911: The First 100 Years. Click here to learn more.